Bicidautore was established in Bologna in 2013. 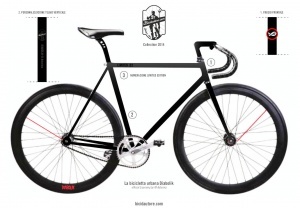 Bicidautore products are turning to the more urban cyclist and collector of all things beautiful related to bicycles. We create high quality bicycles and accessories that represent the Bologna history and feel for Italy and throughout the world. A Bicidautore must be practical, well made and sturdy for lovers of bicycles, designers and artisans. Bicidautore is a company that combines the expertise to create bicycles made in limited numbers where at most as few as ten specimens at a time are made. Our target market is that of the collector and connoisseur and for this reason our passion is linked to the important historical brands and with whom we produce unique series of bicycles and accessories that celebrate the brand and their history. Bicidautor is a company that works with communicates and markets where our products are developed uniquely and independently. Our customers want really exceptionally bikes and we are able to achieve with an attitude of "tailoring" a custom project in every part and detail, from the choice of the geometry, material of the frame and using parts. We apply the same concept to the development of bicycles and accessories for brands that have chosen to trust us. We design, produce and sell bikes and accessories for the urban cyclist. Bicidautore creates retro and innovative products which are focused on a timeless design.